The Nightwatch Series is Govrin’s language of human conductivity where sculptures are made from a unifying single mold yet carry their own identity of illumination. Govrin’s paintings create mythical environments and landscapes for his sculptures to interact. Yossi Govrin is an internationally recognized artist, curator, leader of artists, philanthropist and visionary for the development of the arts, with over 40 years in the cultural world. Govrin is an artist with a diverse cultural background who has exhibited both nationally and internationally for his multimedia work including hemp and cement sculptures, bronze sculptures, paintings, photography and film. 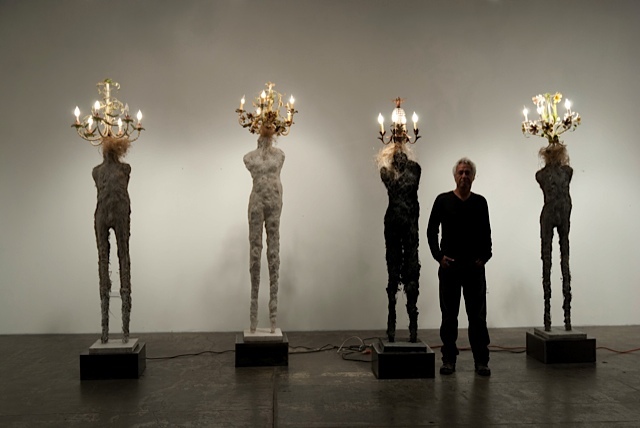 Govrin has been awarded numerous commissions for public monuments, his artwork has been featured in several films and his work is found in private collections throughout the world. Originally from Israel, Yossi graduated from Bezalel High Academy of Art and Design in Jerusalem. Yossi Govrin is a US citizen and works and lives in Los Angeles..
Yossi has founded and led two art centers and several galleries; the Santa Monica Fine Art Studios, the Santa Monica Art Studios, Arena 1 Gallery, Hangar Gallery North and Hangar Gallery South. He has hosted over 600 events in the past 14 years including curators and artists from over 15 countries, shown thousands of emerging artists, helped art related philanthropies, and promoted accessibility of the arts to schools from Malibu to the inner city of Los Angeles. .
Yossi’s unique ability to foster relationships and collaborations is evident from his scope of interaction with a wide range of high caliber curators from universities, museums, art institutes, public figures, established artists and emerging talent. Govrin developed and cultivated his vision of an arts center to support and promote multi-disciplinary artists with the inclusion of the Santa Monica community and Los Angeles in raising arts awareness, providing artist opportunities and conceiving and establishing an art space for a reputable and professional arts center to thrive from the Santa Monica Fine Arts Studio in 1985 to the Santa Monica Art Studios from 2002 to 2019. Because of a struggle with the City of Santa Monica and its Cultural Affairs, Yossi has now founded and established MAXIMA Art Initiative with a strong and diverse staff, Board of Directors and Art Advisors that will continue his vision of bringing artists, curators, local, national and international exhibitions, multidisciplinary programs with art, poetry, music and theatre as well as art fundraisers for supporting philanthropies for a grander vision of the arts.